David Blake and Baron. Photos ©ManciniPhotos. 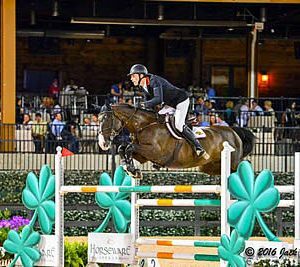 Mill Spring, NC – May 24, 2016 – David Blake continued his dominance at Tryon International Equestrian Center (TIEC) this past week, picking up another grand prix win aboard Baron in the $25,000 Odom Engineering, PLLC Grand Prix on Saturday, May 21. Blake, of Wellington, FL, piloted Baron to a quick jump-off round, finishing in 33.855 seconds to nudge Harold Chopping of Southern Pines, NC and Basje to second place, as they crossed the timers in 34.69 seconds. Manuel Torres of Leesburg, VA and Christofolini H rounded out the top three with a time of 36.826 seconds. 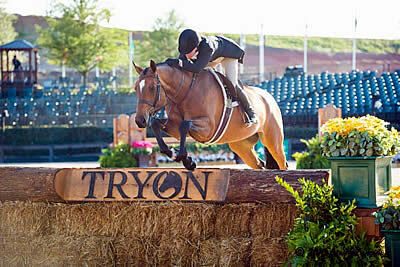 Competition at TIEC continues this week with the start of Tryon Spring 6 on Wednesday, May 25. Blake has finished atop the leaderboard with three different horses in the past two weeks, earning top finishes in the Tryon Spring 4 $10,000 Suncast 1.40m Open Welcome aboard Bella Donna, the Tryon Spring 4 $25,000 Tryon Resort Grand Prix aboard Park Lane, and this past week’s $25,000 Odom Engineering, PLLC Grand Prix with Baron, all owned by Pine Hollow Farm. The course, designed by Pierre Jolicoeur (USA), saw 20 entries test the first round track, while six combinations tackled the first round with ease, to move forward to the short course. Only the top three finishers completed the evening under the light in the George H. Morris Arena with a double clear effort. “It was quicker to jump the open water around the short course, but it made the inside turn afterwards quiet sharp, so it definitely added an aspect of difficulty if you were planning on taking the quickest route,” he continued. Baron has been a reliable mount for Blake, as he competes the gelding in FEI ranking classes aside stable mate Binkie, who Blake has also experienced success aboard at TIEC. Baron, a 2006 Dutch Warmblood gelding (Ukato x Vera van Veecaten), finished the winter circuit with several top finishes, and Blake noted that the gelding feels confident and ready to tackle some of the bigger tracks this summer. With a carefully planned schedule for each mount, Blake will continue to rely on both Baron and Binkie in upcoming FEI competitions that will begin at the venue the first week of June, while continuing to accumulate valuable mileage with Park Lane, Bella Donna, and Casinjo Ex Z. “Baron will show again next week and we’ll look to secure another strong result in that class. Right now I want to get him more experience under the lights, specifically in preparation for some of the upcoming FEI weeks too,” he noted. 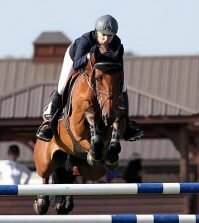 Kelley Farmer of Wellington, FL and Baltimore, owned by Jane Gaston, made an impressive statement in the $10,000 USHJA International Hunter Derby hosted at TIEC on Saturday, May 21. The competition, intended to begin under the lights in the George H. Morris Arena on Friday, May 20, was postponed to Saturday, May 21, after inclement weather forced a schedule delay. Farmer, who has ridden Baltimore to several top finishes already this season, completed the two rounds of competition with a total score of 394 for the win. Jennifer Bliss of Wellington, FL and Poker Face, owned by Harris Hill Farm, LLC, collected second place with a combined score of 378, while Erica Quinn of Maineville, OH rode Need I Say, owned by Kelley Farmer, to third place with a score of 375. The winning duo earned consistent scores throughout the Classic and Handy rounds, which would ultimately give them a strong hold on the class. Farmer entered the Handy round in the lead aboard her veteran partners Mindful, but a small rider error led to an unfortunate stop on course. Baltimore has been a strong addition to Farmer’s talented string of top hunters and Farmer believes that he has all of the right qualities to make him a strong contender in some of the larger derby classes approaching this summer and into the fall indoor season. For Farmer, the schedule change worked in her favor, as she originally was going to specifically choose which mounts she thought would excel in the electric atmosphere that the George H. Morris Arena provides under the lights. Instead, she was able to pilot four mounts, while Erica Quinn, who works for Farmer and Lane Change Farm, guided Need I Say to a respectable third place finish. Farmer will be back to the venue with a strong string of horses in just a few short weeks in attempt to repeat derby victories, as she will contest the $50,000 USHJA International Hunter Derby presented by Mirimichi Green on Friday, June 10. “I cannot say enough good things about this horse show. The ring is fantastic; the footing in beautiful. I thought the jumps looked spectacular. Everyone here at Lane Change Farm absolutely loves showing at this venue and we’re really looking forward to coming back in a few weeks,” she noted. Trapp O’Neal of Hockley, TX and Quilona Z, owned by Carolyn M. Elsey, captured the $25,000 Suncast® Welcome Stake with a time of 37.982 seconds. Manuel Torres of Leesburg, VA and Christofolini H, owned by Andrea Torres Guerreiro, finished in second with a time of 38.093 seconds. Fifty Shades, ridden by Andrea Torres Guerreiro of Waterford, VA, collected third place with a time of 38.72 seconds. O’Neal and Quilona Z laid down the fastest of five double clear rounds to earn first place, while O’Neal also piloted Capitano owned by TKO Partnership, to fourth place with a time of 40.39 seconds. The class saw 24 entries tackle the first round, which was designed by Pierre Jolicoeur (USA), while 12 combinations moved forward to the jump-off round. Lauren Hester of Lexington, KY and Daister L, owned by Hester Equestrian LLC, finished atop the division in the Adequan® Open Jumper 1.30m division, while Manuel Torres of Leesburg, VA and Lily, owned by Santa Catalina Farm, took reserve honors. In the Limo Zen Children’s Jumper 1.10m division, Caitlin Howie of Atlanta, GA and Couture Z picked up divisional champion awards, while Sarah Boston of Owings Mills, MD and Herminas finished in reserve. Madeline Thatcher of West Bluffdale, UT and Skilliane de Varnel, owned by Pony Lane Farm, topped the Tryon Estates Amateur Owner Jumper 1.20m division, while Allison Epstein of Dix Hills, NY and I Watch, owned by R. J. Equestrian Group collected reserve. 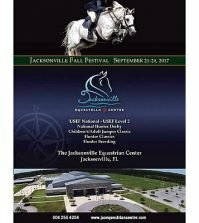 Jennifer Bliss of Wellington, FL and Face the Music, owned by Harris Hill Farm, LLC, finished with a first place in the $1,000 USHJA Pre-Green Hunter Incentive with a score of 91. 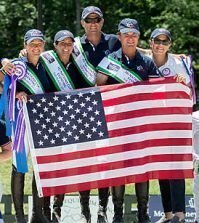 Jennifer Hannan of Wakefield, RI and Best Regards, owned by Patricia Fulchino, earned second place with a score of 87, while John Barker of Middleburg, VA and Calistro, owned by Sherri Crawford, rounded out the top three with a score of 86. 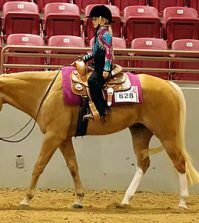 In the $1,000 Junior Hunter 3’6″ Classic, Bergen Sanderford of Santa Rosa Beach, FL finished in first and second place, respectively, winning aboard her own Mystical with a two round total score of 172 and placing second with her own Confidential with a 169. Devin Seek of Ocala, FL piloted At Last, owned by Century Performance Horses LLC, to third place with a score of 168. Emma Marlowe of Lake Balboa, CA and Spalding, owned by Donald Stewart, took top honors in the $1,000 Junior Hunter 3’3″ Classic with a score of 172. Claudia Pollex of Troutman, NC and her own Mylo Xyloto earned second place with a 165, while Marlowe also picked up third place aboard Just Sayin, owned by Fairfield Farms LLC, with a score of 162. Madeline Thatcher of West Bluffdale, UT and Jewel, owned by Pony Lane Farm, took top honors in the $1,000 Amateur-Owner Hunter 3’3″ & 3’6″ Classic with a score of 169. Thatcher also picked up second place aboard Summer Place, also owned by Pony Lane Farm, with a score of 168. Lynn Seithel of Johns Island, SC and her own Walk the Moon rounded out the top three with a score of 161. In the WIHS Pony Equitation class, Jessie Marie Spade of Terrell, NC and her own With Applause captured top honors, receiving an 88, while Libbie Gordon of Statesville, NC and her own Tiffany Blue finished in second with a score of 86. Gigi Manigault of Charleston, SC and Marvel Comic, owned by Patti Manigault, earned third place with an 84. Julia Schaumann of Palantine, IL and her own Cavallino rode to victory in the Ariat Adult Medal, receiving a score of 80. Courtney Canizares of Coventry, RI and her own Keira collected second place with a score of 79, while Madeline Pierce of Columbus, OH and Manhattan, owned by Arris Farms, Inc., finished in third place with a 78. Carly Hoft of Rolesville, NC and her own Cashman took home a major win in the Platinum Performance USEF Show Jumping Talent Search 2*, while Melissa Deryn Foster of Langley, BC and Startin’ Monday, owned by Donald Stewart, finished in second place. Julia Curtis of Villa Rica, GA and her own Rocoso earned third place in the competitive class, which saw 14 entries. 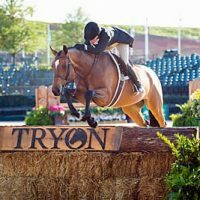 For more information on Tryon International Equestrian Center and to see a full list of results, please visit www.tryon.com.